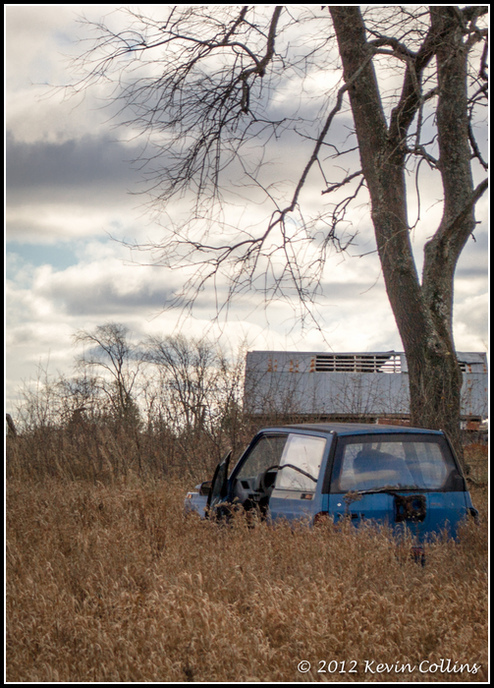 Yesterday I went for a drive in search of some old abandoned places to photograph. I had heard of this run down barn and hay loft with over 40 rusty tractors spanning back to the 1920s, which I thought might be cool. However, when I arrived, there was a big fence and a no trespassing sign right at the road side. Having been asked to leave private property earlier in the day, I wasn’t in any mood to push my luck. I took this shot through my passenger side window with one hand stretched out. The site has some potential, and I might try and seek permission to enter at a later date.